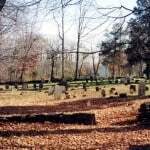 There are 25 known cemeteries in Delaware Township, many of them dating back to the 18th century. They contain the graves of our earliest settlers along with their descendants. 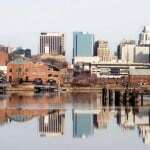 Most are little known, but can lead us to the history of our town. Over the years, many historians and genealogists have gone looking for the old cemeteries, and thankfully, they wrote down the names and described the cemeteries. 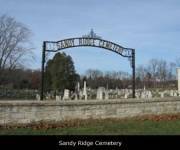 Based on these writings and on cemeteries I’ve been able to visit, this seems to be a complete list of known township cemeteries. It is quite possible that there are other small family burying grounds located in out of the way places that have long since fallen into the earth, that were never located and identified, never recorded. And may never be found. The Lenape were the first people to live and die in our township. They were seasonal visitors who came to hunt and to make tools at certain times of the year, and then moved on. In Archeology of Warren and Hunterdon Counties, 1917, Max Schrabisch did a survey of known Indian habitations and identified several in Delaware Township. He located a Lenape burial ground at Mount Gilboa, not far north of Lambertville and the Alexauken Creek. It can be seen on older USGS topographical maps of Delaware Township. It must have been a special place, giving a view of the Delaware River as it came down from the northwest and swung to the south. In the 20th century, Trap Rock started turning the ‘mountain’ into gravel. One way to think about township cemeteries is how they are owned. There are what I call public, semi-public, and private cemeteries in Delaware Township. 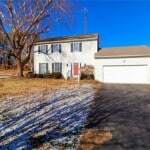 Ownership is presently held by a public entity, either a church or an independent cemetery organization. Maintenance is taken care of by the originating agency or by a related organization. 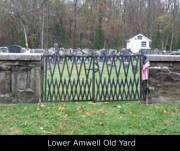 This cemetery is along Route 202 as you approach Lambertville. 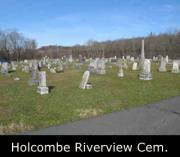 There is no written history of the cemetery, but it was started by the Holcombe family in either 1873 or 1893. 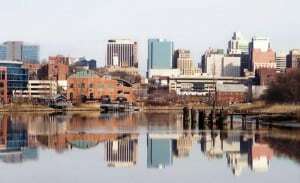 Mrs. Sutterly, who kept track of the records, said there were also people buried in an area between the canal and the river. These may have been canal workers who died of cholera in 1832, or possibly early members of the Holcombe family. Many familiar names are in this cemetery, like Naylors, Holcombes, Slacks, Hunts, and others. 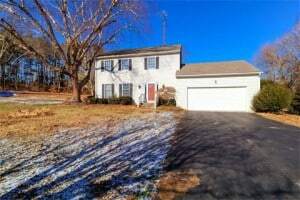 John Holcombe and his wife Elizabeth Woolrich bought land here in 1705 and 1709, and are considered the earliest settlers in Delaware Township, although some might argue that John Reading and his family got here first. The Holcombes and Readings probably came about the same time. John and Elizabeth Holcombe were Quakers who went to meeting in Buckingham, PA. This was long before there were ferries or bridges over the river, and family history says they would ride their horses across the river, although probably not during the spring freshets. 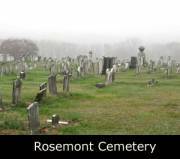 The Rosemont Cemetery is easy to find once you get to Rosemont. 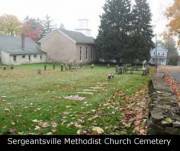 It is probably the largest cemetery in Delaware Township. The first person buried there was a visitor to the area, a young man from England who came to see George Fox in 1727 and died soon after of ‘ship fever.’ In 1729 Fox sold this part of his farm but set aside a quarter acre for a burial ground. The cemetery was incorporated in 1912, almost 200 years after the first person was buried there. The earliest stones all have initials and dates, leaving us to guess who they were. It is said that the oldest stone read “C K 1748,” but whoever C K was remains a mystery. A large number of them have a W for the surname. 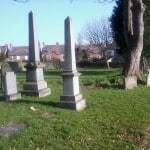 The two most common families buried here are Williamsons, Waterhouses and Woolvertons, but there are also early Woods and Wilsons. Elizabeth H. Woolverton died in 1785 at the age of 72. This was probably Elizabeth Pettit, who married Dennis Woolverton about 1740. Dennis Woolverton was the son of Charles Woolverton and Mary Chadwick, who came to Amwell (Delaware) Twp. around 1715, and had nine children who left many descendants here. One of the gravestones reads “J S W 1773” and is probably John Woolverton who inherited the mill at Prallsville from his father Charles Woolverton in 1761. 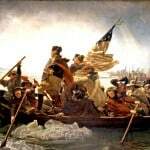 Of course, one cannot omit Daniel Bray (1751-1819), who is credited with collecting the boats for Gen. Washington’s army to cross the Delaware, and then hiding them from the British. Bray was married to Mary Woolverton (1756-1840), daughter of Dennis Woolverton and Elizabeth Pettit. Their son Amos Bonham (1752-1817) and his wife Rebecca Rittenhouse (1758-1830) are here. 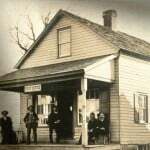 She was the granddaughter of the first Rittenhouse family to settle in Delaware Township. The Lower Amwell Old Yard was the first cemetery attached to the Amwell Church of the Brethren, once known as the German Baptist Church of Amwell or the Dunkards. Snell called the Old Yard “the German Baptist Burying-Ground.” The yard was donated to the church by Gideon Moore, who had purchased the lot in 1839. 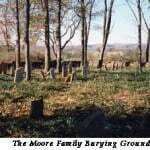 Previous to this date, many church members were buried in the Moore Family Burying Ground nearby. The surrounding stone wall was built in 1840. In 1939, Hiram Deats and Carroll Britton copied the names they found in both the new and old yards. Some of the oldest graves here are Philip Bevin (c.1747-1839) Mary Case (1753-1846) and Mathias Peoplesdorf (c.1757-1848). Peoplesdorf is an interesting surname and reflects the German heritage of this part of the township. Although Daniel Moore (1762-1860) is probably the oldest Moore in the Lower Amwell Old Yard, he was the grandson of the first of the family, Jacob and Amy Moore, who came from Germany around 1705. Rev. Israel Poulson (1770-1856) and wife Hannah Moore (1776-1839) are here. Rev. Poulson was the most important minister to the German Baptist Church of Amwell. He gave the land for the church in 1811, and ministered for over 50 years. Cornelius Lake (1762-1842) is here, but his wife, Mary Sergeant (1765-1813) is buried in the Pine Hill Cemetery. Cornelius Lake was the Commissioner of Deeds for Delaware Township in the 1820s. For a time he ran the tavern at Howell’s ferry. His farm was located just southwest of Sergeantsville. John Arnwine Carrell (1810-1895) was a farmer of Headquarters, renowned for the size of his animals and crops. Also his wife Amy Myers (1813-1888). Their son George W. Carrell (1839-1882) and his wife Elizabeth W. Fauss (1847-1911) are here and their infant child who died in 1860. 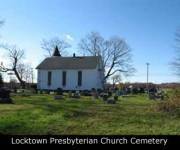 This cemetery was probably begun in the 1830s, since the Locktown Christian Church was established in 1829, and the church building was erected in 1833. Some of the church trustees are buried here, but some are not. 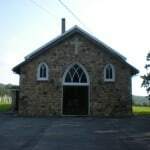 For instance, Elisha Rittenhouse, who superintended construction of the Locktown Baptist Church in 1819, was a founding member of the Christian Church ten years later. But he is buried elsewhere. Other founding trustees were Francis Robeson and Samuel Cooley, who was replaced by Philip Gordon. None of them are here, but Tunis Servis (1791-1877), trustee from 1830-1840 is here with his wife Elizabeth (1791-c.1875) and daughter Miranda (1810-1861). John Buchanan (1800-1890) is here, grandson of John Buchanan the innkeeper, and his wife Catharine ‘Katie’ Williamson (1803-1891). Katie Williamson was given a surprise birthday party by her family in 1888 when whe was 85 years old and had been married for 63 years. By then she had 29 grandchildren. Edward M. Heath (1837-1916) is buried here. He was the first County Superintendant of Schools in Hunterdon. His wife Annie B. Trout (1831-1922) is here, their son Robert T. Heath (1866-1938) and his wife Lizzie Ruple (1867-1900) and their children Elizabeth (1881-1958) and Edward M. (Jr.) (1911-1995). This cemetery is quite large and is well maintained by the Church. It had its first burial in 1819, a year after the Sandy Ridge Baptist Church was constructed. The person being buried was Rebecca Doyle, one of the earliest Irish immigrants to our area. Historian Jonathan M. Hoppock wrote that in early days, people depended on neighbors to help with the job of digging graves. Rebecca’s grave was dug by Garret Van Dolah. When Benjamin Bodine came by, he asked who was being buried, and when told, got a shovel and helped with the digging, having said: “I want it said that I helped to dig the first grave in this yard.” It is now 188 years later, and it is still being said. A row of 24 graves is occupied by members of the Hunt family. The oldest Hunt whose stone survives is Jacob Hunt (1763-1843) and wife Elizabeth Phillips (1761-1842). Others in this cemetery are Daniel Butterfoss (1742-1818), and wife Esther Ent (1757-1846), John Smith (1754-1828), and wife Anna Dilts (1756-1843), Idabela Ent (1759-1824) wife of Peter Bodine, Tunis Case (1761-1846), Rebecca Ent (1762-1855) wife of John Ent Sr. (1766-1855), William Dilts (1765-1831) and wife Catharine Holcombe (1774-1868), John Lair (1778-1854) and wife Sarah Dilts (1782-1852), and Garret Wilson (1782-1876) whose wife was Mary Butterfoss. These names tell you who the prominent families in this neighborhood were. Nancy Lake (1792-1835), wife of Jonas Thatcher, first postmaster of Sergeantsville in 1827. Jonas Thatcher’s grave has not been found. However, Nancy Lake was probably one of the first members of the new Methodist congregation. She died before the church was built, so either the cemetery preceded the church or she was moved to the new cemetery when it opened. Peter Green 1772-1852), Blacksmith of Sergeantsville, and wife Abigail (1773-1856). He may have apprenticed to Joseph Sergeant, the first blacksmith in Sergeantsville. John Green (1794-1877) and wives Prudence Jackson (1796-1847) and Mary Huffman (1802-1896). Green was a blacksmith in Sergeantsville, and was probably the son of Peter and Abigail Green. John H. Gordon (c.1797-1876), son of Othniel Gordon, was a wheelwright in Sergeantsville. His wife Catherine Case (1797-1886) is also here, as well as John’s sister Nancy Gordon (1810-1851). Henry Wagner (1792-1866) Tavernkeeper of Sergeantsville when Delaware Twp. was created in 1838. 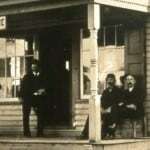 The first township meeting was held in his tavern. Finally there are the Fishers. Henry H. Fisher (1801-1881) is here, one of the founding members of the Methodist congregation and important to the history of Sergeantsville; also his wife Anna Johnson (1815-1878), daughter of Wm. Johnson and Urania Sergeant. John G. Fisher (1792-1865) is here, possibly the brother of Henry H. Fisher. 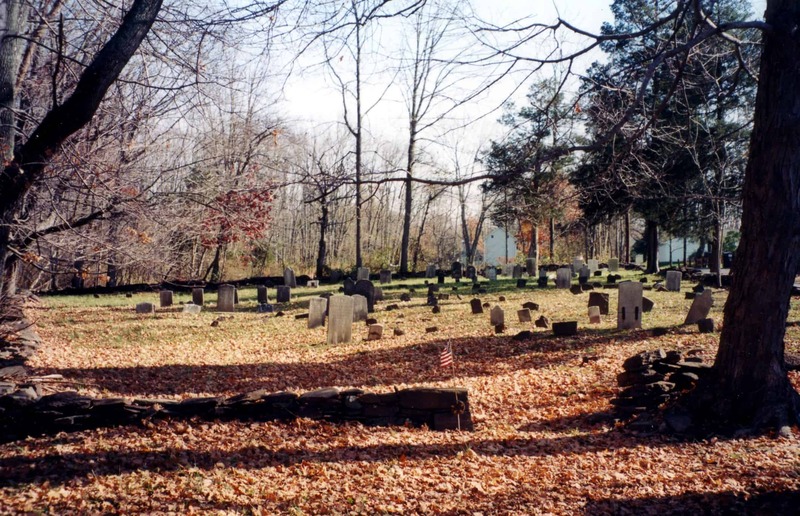 Future installments will discuss the semi-public and private cemeteries in Delaware Township. Be sure not to miss the Part 2 .